» What is Goldenseal Root? The Goldenseal or Orangeroot plant (Hydrastis Canadensis) derives its name from the distinctive colour of its roots, caused by a substance called Berberine. The plant is native to the North Eastern part of the United States and South Eastern Canada. The plant's root have been used by Native Americans for centuries as both a medicine and a natural dye. Unfortunately over-harvesting of this plant as well as the destruction of its natural habitat has led to Goldenseal being listed as an endangered plant species. 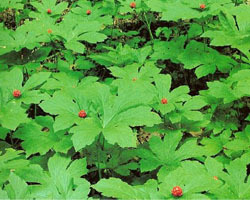 Goldenseal Root is used by herbalists as an alternate medicine. Many of its properties can be attributed to the presence of an alkaloid salt in the root called Berberine. Berberine has a distinct yellow colour that is used as a natural dye. However it is Berberine's wide ranging medicinal properties that have been getting researchers excited. Now Foods Goldenseal Roots are wildcrafted in the U.S.